From about the start of the 20th century this property belonged to stationer and newsagent Mr S.Brooks and his wife Susannah, who continued the business after her husband’s death in 1906 until about 1933. In 1934 the property was occupied by the Britannia Fruit & General Stores (W.Somers), which is listed in the trade directory, rather strangely to modern minds, as a retailer of “tobacco & fruit etc”. By 1935 this had already changed to Thomas Giddings’ grocers shop and then again in 1936 to Mr George Twigg, boot repairer. Mr Twigg was here as a bootmaker and shoe repairer for many years and the business sometimes traded as the Wearwell Shoe Service. His was a drab little shop only brightened by pots of geraniums and fuschias lined up on the steps outside, which Mr Twigg grew in his garden to sell. Following his retirement the shop was empty for a while and it was finally demolished in 1990, along with two of its neighbouring premises, to create three new units. This one was a soft furnishing shop but towards the end of 1998 it was taken over to enlarge the video tape rental shop next door, called “The Video Nest”. From the late 1970s until about 2000 video magnetic tape was a popular medium for recording and distributing feature films and other audiovisual entertainment, although it has largely died out today, and was replaced first by DVD. More recently streaming data over the internet has become easier with the advent of high speed networks and video hire is much less common than before. 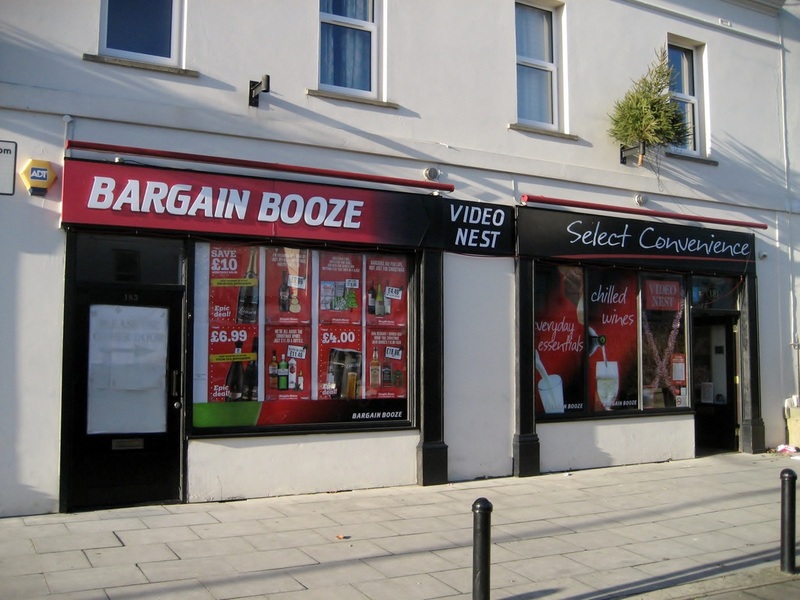 Today these premises are occupied by Bargain Booze Video Nest, which sells discounted alcohol, general groceries and frozen food and offers some DVDs for home rental. In October 2014 this shop was divided back into two and the left hand part (183 Bath Road) became Milano Café.